A published survey from the UK showed that the success rates of a particular Fertility Centre is a key factor for patients in deciding which Fertility Centre they choose. Therefore, it is not unusual for patients to ask me what is the success rate of IVF in my centre. In places like UK, it is mandatory to submit the centre’s data to the authority (Human Fertilisation & Embryology Authority, HFEA) for publication and regulation. However, in Malaysia, these data are not readily available. A clinic that treats proportionately more patients with complicated diagnoses may have a lower average success rate than clinics that treat more patients with common fertility issues. Clinics may have higher success rates for treatment if they treat women who are not infertile but who have no male partner and are using donated sperm in their treatment. The chart above showed that if you are under the age of 35 and attempts one IVF, your chance of getting pregnant by putting back 1 or 2 embryos during the same cycle is around 60%. If you do not get pregnant during the fresh attempt and have enough good quality embryos frozen resulting from that particular IVF cycle, your chance of pregnancy by having a frozen embryo transfer is around 60% as well. Hence, if you look at the pool of patients under the age of 35, taking into account of both fresh and frozen embryo transfer, the success rate is around 80%. This translates that 4 out of 5 couples who are under the age of 35 will get pregnant with just an IVF attempt. 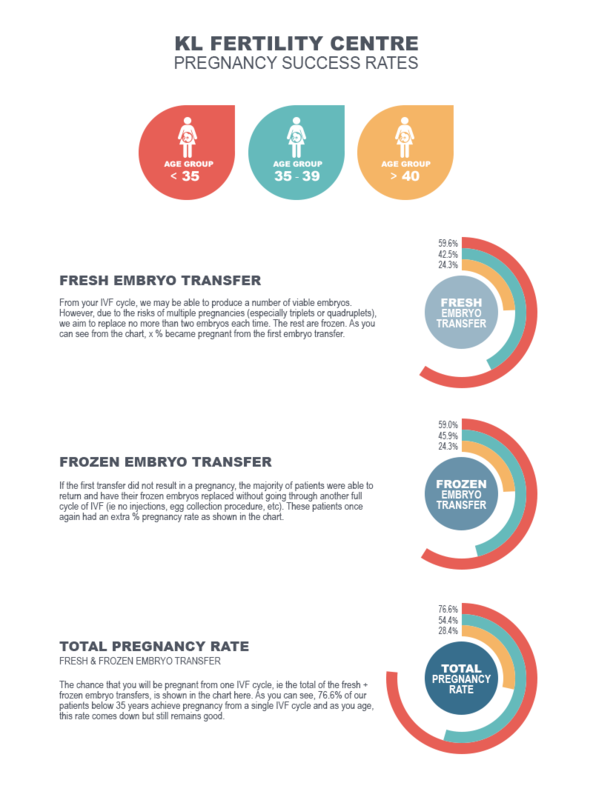 Therefore, if you have not been successful during the fresh embryo transfer cycle and have enough embryos frozen, you can be reassured that your chance of pregnancy is extremely likely during the frozen embryo transfer!!! This entry was posted in IVF, IVF Success Rates and tagged Fertility Centre. Bookmark the permalink.